Beginning Friday, April 24, and lasting through Sunday, April 26th, 2015, the Wakarusa Maple Syrup Festival will be celebrating 46 years of family fun and entertainment. It’s a time when folks can get together, be entertained and learn about a historic nook of the country. This year’s festival looks to be one of the best and with such a great turnout already expected, the festival has already reached its maximum capacity for food vendors, and the event is still several weeks away. Musicians of all ages and types will play vocal and handheld instruments on each of the 3 days. Northwood Middle School Singers will sing Friday afternoon. Country Music Star Levi Riggs will perform a 2-hour show on Saturday. Sunday will feature a time of worship, sponsored by the Bethel Missionary Church, and the Christian band WE ARE LEO will perform on Sunday afternoon. Sunday will conclude with a 2 hour “Wakarusa’s Got Talent Show”. There are even more than what I’ve mentioned here. Also, don’t miss the Wade Henry Show at Richmond’s Feed Service Entertainment Area #2, with numerous show times each of the 3 days. Music, animals, magic, and all sorts of entertainment can be found every day at the Festival. Check here for a full list of shows and times. You like entertainment, but perhaps you find a walk through the past is more enjoyable. The Wakarusa Historical Museum has a number of ways to satisfy the inner historian in all of us. Take a walk through Grandma’s Haus or visit a blacksmith as he strikes the hot iron. Experience a one-room school house and visit a preserved veterinary/doctor office that includes an iron lung. Have a taste for something sweet? Take a sugar camp tour and discover how 40 gallons of sap is turned into a single gallon of maple syrup. Doesn’t that sound like a tasteful experience? Find out more about the tours here. The Festival is also sponsoring a number of contests. Try out your confectionary skills in the Maple Baking Contest. Compete in Wakarusa’s Got Talent. Are you a photographer at heart? Enter the “Planes, Trains & Automobiles & Nature of Elkhart County” photo contest for your chance to win $100 for Best of Show. There are so many contests that there is a chance for several attendees to win something. Be sure to pre-register if the contest requires it! Scottish Bed & Breakfast is just a brief drive from the festival. Why not join us during your weekend visit to the festival? We have comfortable, quiet accommodations, and we make the perfect resting headquarters after a fun-filled day. Get your room booked in advance so you know you’ll have a place to stay. 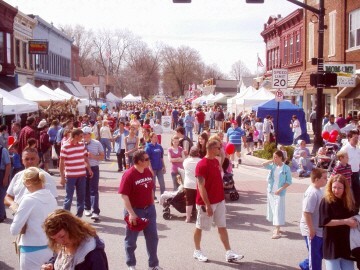 This entry was posted on Friday, April 10th, 2015 at 10:00 am and is filed under Wakarusa Maple Syrup Festival. You can follow any responses to this entry through the RSS 2.0 feed. Both comments and pings are currently closed.